Enterprise death is when there has been no turnover nor persons employed for two consecutive calendar years. A total of 2,895 enterprises in the business economy discontinued operations in 2015. Individuals with operation on their own personal identification number are included in the enterprise definition. These enterprises’ combine turnover was over 36.5 billion ISK in 2015 and the number of persons employed in these enterprises was over 3,000. The majority of the enterprises were small, with over 92% employing none to one person and a combined turnover just under 15 billion ISK. 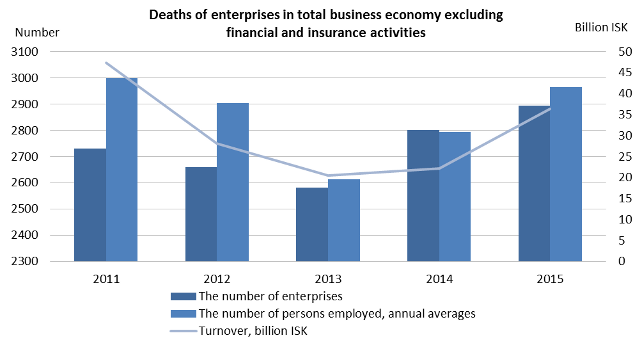 Enterprises that had two or more persons employed in their last operating year were just under 8% of total enterprise deaths, but their combined turnover was 21.5 billion ISK in 2015. Over the five-year period 2011-2015, fewest enterprises discontinued their operations in 2013 and most in 2015. High technology manufacturing and services had the highest death rate, between 10% and 13%, compared with other economic activities in 2011–2015. Construction industry had the second highest death rate, between 10% and 12% during the same period. The lowest death rate of enterprises was in manufacturing and fisheries between 6% and 9%. Enterprise death is when there has been no turnover nor persons employed for two consecutive calendar years. When operation of enterprise moves between identification numbers, it is not considered death unless two of the following three conditions are met; operation is in another economic sector according to ÍSAT2008, operation is carried out at another location or the majority of staff has been changed. Adjustments are also made in connection with mergers and split-offs.